FTS February, 2019: Hey Reefers! Super excited to be sharing my new build here at Nano-Reef. 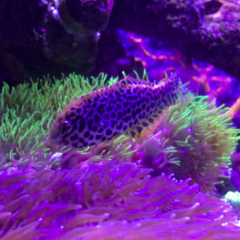 I’m a long-time follower of this community and have been a saltwater and reef hobbyist for over 30 years. With family, life, and career, I have been waiting for the right time to start a new tank build. My last tank was way back in 2005, with a JBJ NanoCube 12dx, from NanoTuners. Here’s a pic of 12 gallons of Softy Glory, all that it was: Fast forward to 2018. I’ve been fighting the reef bug for 3 years, and I just couldn’t shake it. Work relocated me and the fam to the great state of Minnesota, and I visited some of the LFS’s in the area. I walked into a reef mecca in Plymouth, MN and was immediately hooked. I knew I had to have a tank. My supporting wife says, “You work so hard, you deserve this!” That’s all I needed to hear. So, what does a recovering reefer 13 years sober do? 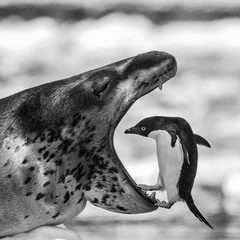 Scour the forums, learn what’s hot ‘n not, and then shoot on over to BRS and pickup a car full of reefing gear. BRS is 20 minutes from my house, and that’s just too darn convenient. Enough with the backstory blah blah, here’s my build: Tank: Innovative Marine Nuvo Fusion 20 Stand: Bush Furniture computer armoire matching my office furniture Lights: (2) Aqua Illumination AI Prime HDs with rigid mounts, running BRS AB+ spectrum Return Pump: Innovative Marine MightyJet AIO Pump 538gph Heater: Cobalt 75w NeoTherm Control: Ink Bird ITC-308 ATO: AutoAqua AWC Auto Water Changer Plus ATO ATO Reservoir: Innovative Marine 5 Gallon Hydrofill Flow: (2) EcoTech Marine Vortech MP10WQD paired in Tidal Swell Mode (TSM) Filtration: (2) InTank Media Baskets, filter pads, and a bag of MarinePure Gems for biological Export: AquaMaxx Media Reactor converted into DIY Cheato reactor Testing: Hanna, Red Sea, Salifert Livestock: Two Black Ocellaris Clowns - "Ace & Gary" Tail Spot Blenny - "P-Blenny" Royal Gramma - "RG" Two Gold Ring Cowries Two Banded Trochus Snails Two Cerith Snails History: The tank was assembled over Christmas, 2018. Water was added 01/01/2019, all gear tested and configured. Water was brought to temp (78F), specific gravity set at 35ppt. Live rock was added 01/03/2019, and the tank was fishless cycled with Dr Tim’s One and Only and ammonium chloride. The cycle finished in two weeks, which I attribute to the rock and the bottled bacteria. Once the tank could process 2ppm of ammonia in 24 hours, it was time for a 75% water change. Nitrates were floating around 50ppm at this point, so I was happy to oblige. Knowing I was a day or so from adding my first occupants to the tank fueled the water change excitement. Future: My plan moving forward is patience. There are lessons I learned on my own, and from those who post journals here. My hope is to avoid failures, mistakes, or overlooking something obvious. 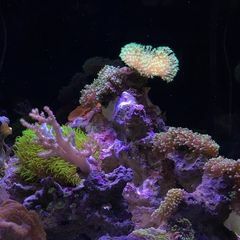 I’m targeting mostly SPS in this build, but I’m sure Acans and Zoas will work their way into the tank along this journey. Current water parameters: 2019-02-24 Temp: 77.2F Specific Gravity: 35ppt Ammonia: 0ppm Nitrite: 0ppm Nitrate: 0ppm Phosphate: .07ppm Alkalinity: 8.6 DKH Calcium: 470ppm Magnesium: 1440ppm FTS January, 2019: Setup: Live rock added and start of cycle: AquaMaxx Chaeto Reactor: Water Station & RODI: There’s a lot I’ve learned from this community. I want to start by saying thank you, seriously. Without your commitment to this hobby, and sharing information or lessons learned, there would not be this database of knowledge one can so easily tap into to build their vision of a perfect reef. Until next time! October 2018 FTS Well, here goes! After having been out of the reefing world since 2007, this past December I decided to start up a simple 10g tank... a few fish, some corals, nothing fancy. Of course I underestimated how much I love this hobby and couldn't resist the urge for something just a little bigger with a few more bells and whistles. Enter the IM 20 Fusion... the box was bigger than expected upon arrival, pretty sure the UPS man was cursing me while hauling it out of the truck at 830pm. Equipment - 20 gallon Innovative Marine Fusion (Actual volume ~14 gallons) - Stock return pump Since 1.5 Return Pump - Hydor Koralia 240 Powerhead x2 - Aqamai KPS powerhead - Finnex HMO 50W Heater - Smart Micro ATO - Nanobox Duo Plus - Apex Jr. - 2x BRS 1.1mL/min dosing pumps - Dosing BRS 2-part Filtration - Innovative Marine 200 micron filter sock (left chamber) - IM media caddy with filter floss and chemipure blue - Chaeto reactor - ~15lbs live rock - ~20lbs aragalive live sand Stocking - True Percula Clown x2 - Sixline Wrasse - High Fin Red-Banded Goby - Yellow watchman goby - Jawfish - tailspot blenny - Randalli Goby Not gonna fit down the hallway like this BRS did a great job with the exterior packaging and the tank itself was well secured within the interior box. Looks great on the stand I debated doing a full tank switch in one day, but opted for patience and decided to allow the 20g to cycle using water from the 10g and some of the established sandbed. The 20g is going where the 10 is currently sitting, going to have to perform some delicate moving to make room... With some help from the fiance' we got both tanks moved, now I just have to level up the stand and get some water in this thing, then going hunting for some additional live rock! Right now, everything is still stock on the IM20, debating upgrading the return pump for a little more flow any and all suggestions are welcome! Hello all! I was just wondering what all you IM fusion owners run as filter media on your tanks. I am currently cycling my IM10, and am currently only running poly filter in my media basket. Anybody run carbon? 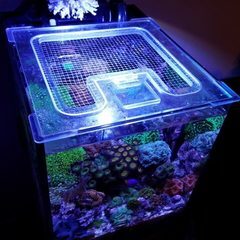 Also am thinking about buying the refugium and adding cheato. 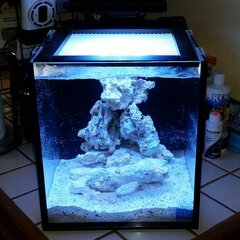 Thinking about getting an IM Nuvo 10 gallon and am debating between 3 lights. The aquamaxx nemolight (here) , a single par30 led 18k bulb (here) , and the Hipargero 30W light (here). They are all in the same ballpark cost wise, I want to keep it budget friendly and under $100. Each seems to have advantages, the nemolight being the most controllable and easy to use, but the most money and least amount of power. I do like its programmability and the thunderstorm feature. The other two seem to be similar in power and cost (minus the cost of the fixture for the bulb) but lack control and need to be manually dimmed (or not dimmed at all) and therefore are pretty much either on or off. It would be nice for them to ramp up and down during the day but I guess its not a dealbreaker. Also, how long until the single bulb would need to be replaced? 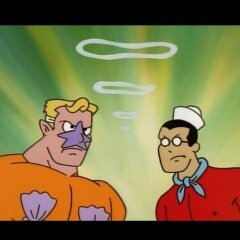 I want to be able to have some SPS if it is at all possible. Anyone have any thoughts? Or other recommendations staying in the <$100 range? Thanks for any replies. 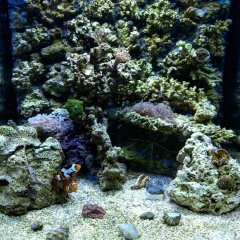 Chuck's catty-corner, counter top nano reef! Just wanted to share my Innovative Marine Fusion 40. Been up for a couple months now. Radion Xr30w Pro with diffuser, Mighty jet return pump, 2xmp10s, Hydrofill Ato. New fusion 10 build updates! Hi everyone! I am going to be starting an official journal for our new fusion 10 build Quick background on us, we had a 75 gallon for about 4 years, bought a house and when the tank moved we lost almost everything over about 6 months and realized with the new house we didn’t have the time. Now that we’ve settled we have decided to try a nano tank and hope to re set up our 75 in the future. We started the tank cycling the end the end of December 2017. Cycle is complete and water parameters are good. Had a short stage of cyanoalgae but rearranged the rocks and added a powerhead for more flow and have not had any issues since. What we have as of now: im fusion 10 tank upgraded media basket caddy with filter floss and chemipure nano ghostmate desktop skimmer hydor nano powerhead 4 pounds of live rock with 1 large dry rock that has since been seeded 7lbs of Carib sea bahama oolite sand AI prime hydra light with flex arm mount LIVESTOCK 1 firefish 4 nasarius snails 2 turbo snails looking to add a black clown goby and a citron goby and some more cleanup crew We had a massive bloom of copepods which have since dwindled to a smaller amount. One morning I came out and the entire tank was full of them ? Will be slowly adding corals to the tank as well. 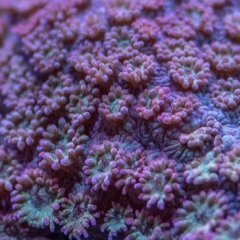 We currently have one little favia frag that was pretty cheap and basically our test piece to see how it does. Thinking of doing mostly lps corals, but not really sure exactly at this point. 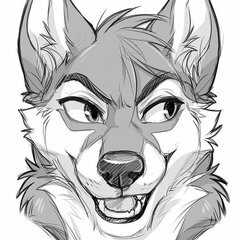 We are looking into auto top off systems please give your recommendations! Also what other parameters should we be testing testing regularly besides ph, sg, ammonia, nitrate, nitrite? Thank you!! Hello Fellow Nano-Reefers, So I came across an amazing deal today on both of these tanks, convinced my wife I can "Upgrade" from my JBJ Nanocube 28. I am seeking out opinions on both of these tanks. I currently have an IM Nuvo 20 in my classroom, so I am fairly familiar with how they work. Why am I "Upgrading," really it's a personal liking of a "shallower" tank, I have a hard time with Maintenance in my JBJ Nanocube 28 because of how deep it is. And I really want a little larger footprint, I really don't think I would feel good having larger than a 30 gallon in my house, we live in a house that is 125 years old and I'm not sure I trust the floor with that much concentrated weight on it :-) I am also probably going to need at some point some help on lighting, I have a few in mind already (I won't be doing much SPS except lower light things like Birdsnest and Stylaphora.) But I will cross that bridge when it comes. For now help me out... What do you like about both of these tanks if you have them, if you have had both even better! Dimensions: IM 25 Lagoon - 24in X 20in X 12in(H) IM 30L - 36in X 15in X 13in(H) I realize I will lose 4in in Depth on each one for the AIO filtration, but again I am used to that in the 20 in my classroom. Help me out! TIA! 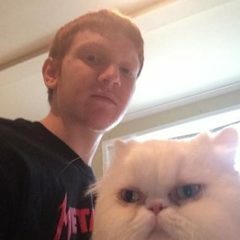 Hey everyone. This tank has been running just over a year and is doing pretty well, seems like the right time to do a build thread. Innovative Marine Nuvo Fusion 20 Ecotech Radion XR30 (Gen1) Ecotech Vortech MP10 Digital Aquatics RK Lite DA SL2 w/ Temp/PH/Salinity Probes IM Desktop Ghost Skimmer IM Hydrofill Ti ATO w/ Aqualifter Eheim Jager 50W Heater I have IM custom caddy's on both sides with floss, bags of carbon, and Seachem Matrix in that order. I've started dosing Red Sea Foundation A,B,C by hand Pics! 2/25/17 3/29/17 built a conduit light mount 04/13/17 05/13/17 I moved over the summer and it was pretty rough on the tank. I ended up battling high Nitrate and Phosphate and lots of algae for a few months afterwards. 09/08/17 10/31/17 I changed up stands PEAK ALGAE 02/23/18 Tank seems like it's back on autopilot now, Nitrates undetectable using Red Sea kits, Phosphate hovers between .05 and .10 You can see my two fish in this last one, a Tailspot Blenny in the middle and a Rainfords Goby hiding in the bottom left Thanks for looking!